I hope the week has treated you well, and that you’re looking forward to something this weekend! I feel a tiny bit sad because although I don’t leave until Monday morning, Saturday and Sunday are going to be packed for me, mentally and physically. I kinda feel like tomorrow is my last relaxing day to enjoy with my friends. Today was another great day! It started just as the last few have and ended much of the same: CrossFit, girl time, wonderful dinner and interesting conversation. The two-for-one wall balls with a 14# WB were 100% impossible for me, but they didn’t have anymore 10#! It was struggle city and I was cursing the damn ball every single rep. I was trying to throw the WB high in order to have time to squat twice, but then the ball landed with more force and … it was just tough. I was happy when it was over! 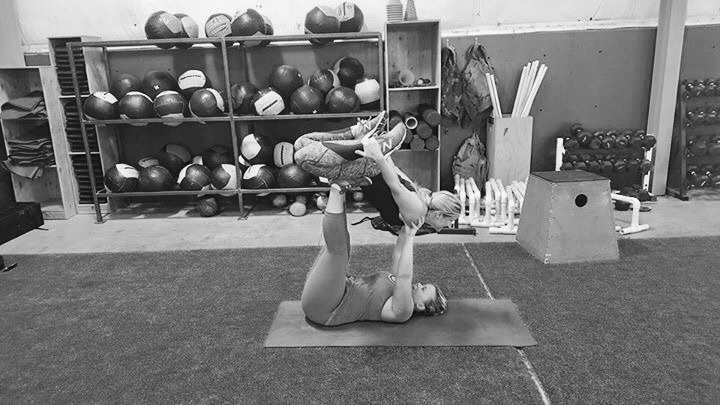 After the workout, I practiced rowing while the others did abs (snore), and then we played around with some acro yoga poses. Every Friday at this box is trainer’s choice, so I’m sure tomorrow will be killer!